Following the release of about 101 Dapchi school girls kidnapped by Boko Haram today, the Governor of Ekiti State Governor, Mr Ayodele Fayose has congratulated parents of the children. He also sympathized with parents of five of the girls that reportedly died. 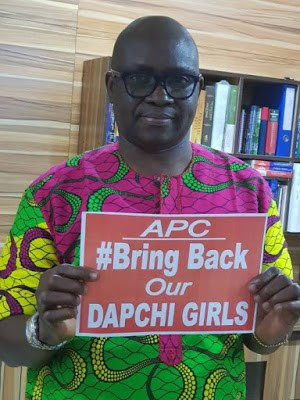 In a statement issued on Wednesday, by his Special Assistant on Public Communications and New Media, Lere Olayinka, Governor Fayose said it was strange that the girls could be brought back to Dapchi by their abductors without the security agents knowing when they were returned and who returned them. He said: “Curiously, the same spirit who made sure that all military checkpoints in Dapchi and other surrounding towns were removed to pave way for the abduction of the girls also made sure that the girls were returned without any security agent seeing them. “One can only be hopeful that the real scriptwriters behind this drama will be exposed one day. “Nigerians should recall that the Governor of Yobe state, Ibrahim Geidam said that military checkpoints were withdrawn from Dapchi and other communities a few days before the abduction of the 110 girls. "This was also corroborated by the Amnesty International in its report that was published in the newspapers yesterday. “Specifically, Amnesty International said that security forces failed to act on advance warnings that a convoy of Boko Haram fighters was heading to Dapchi town and that between 2:00 pm and 6:00 pm on February 19, 2018, calls were made to tell the security services that the Boko Haram insurgents were in the Dapchi area. “No doubt, withdrawal of military checkpoints from Dapchi and other communities, few days before the 110 students were abducted and failure of the security forces to act on advance warnings exposed the conspiracy of the federal government and its agents in the abduction of the schoolgirls and other dastardly acts of the insurgents.